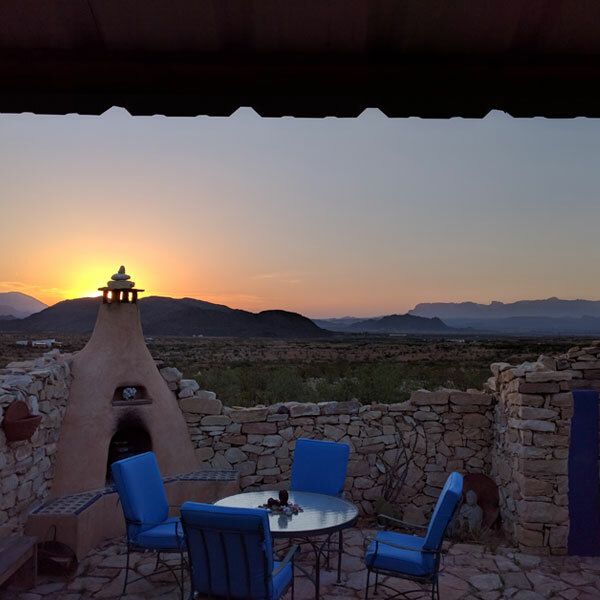 If you’re looking for relaxation, privacy, and a chance to truly enjoy the beauty of the desert, the Guest House has just what you seek. Stretch out in a hammock or watch the stars from an outdoor bed. 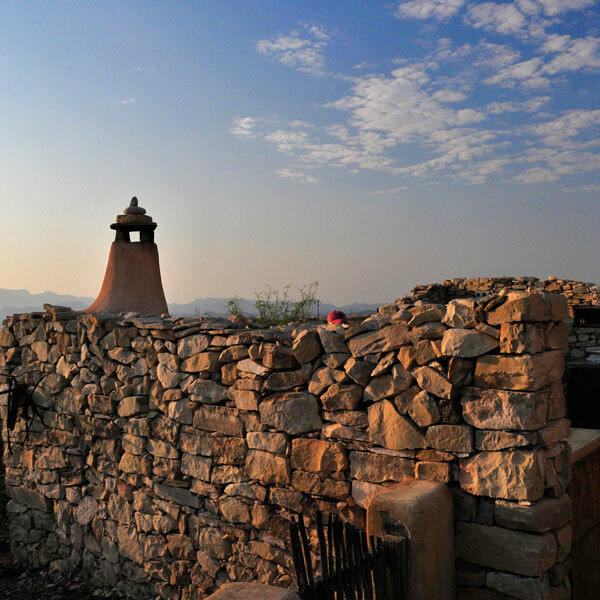 Warm up by the handcrafted fireplace, or soak in the tub while taking in the desert landscapes. 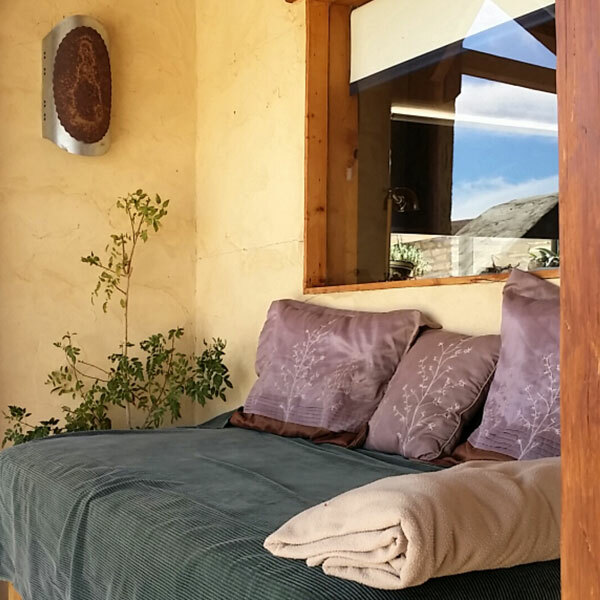 The Guest House is the perfect size for individuals or couples, and provides a lovely, secluded retreat. 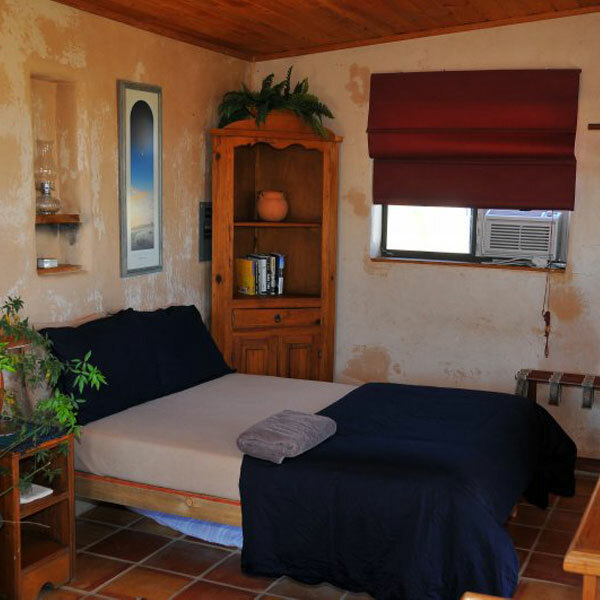 The Guest House is the most private of the home rentals and features 3 beautiful courtyards. 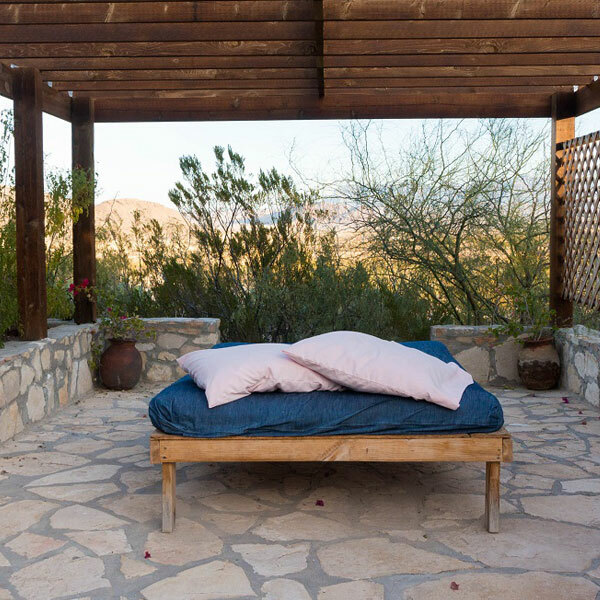 The first features a hammock, yoga rug, and stunning views. The second has an outdoor shower, a handsome outdoor fireplace, and kitchen sink and counter, all enclosed by 5 foot rock wall for privacy. 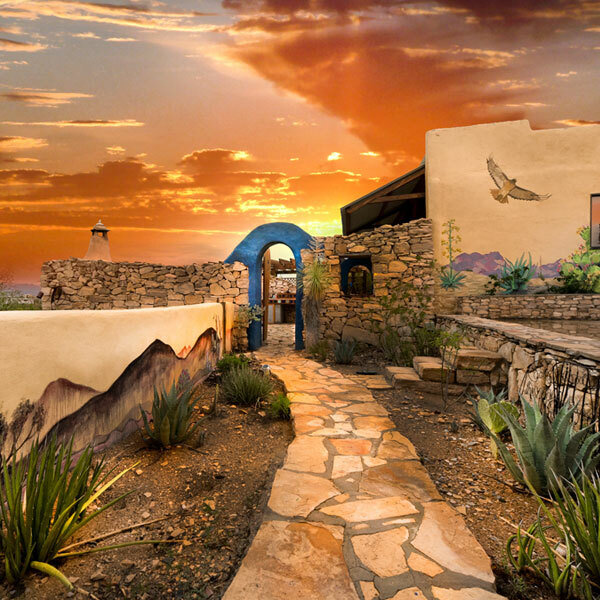 The third courtyard has an arbor surrounded by flowers, where one can relax on a full-size bed and enjoy the desert vistas. 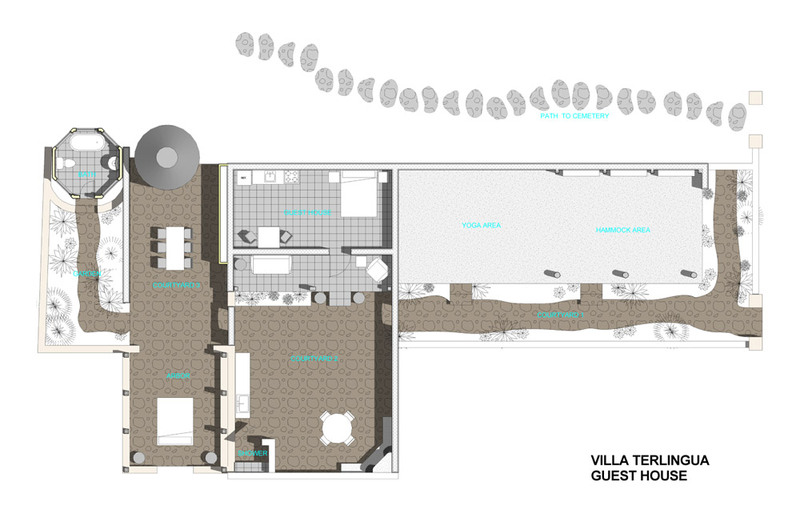 The Guest House’s one-room structure houses a queen-sized bed, full kitchen, and a breakfast nook. 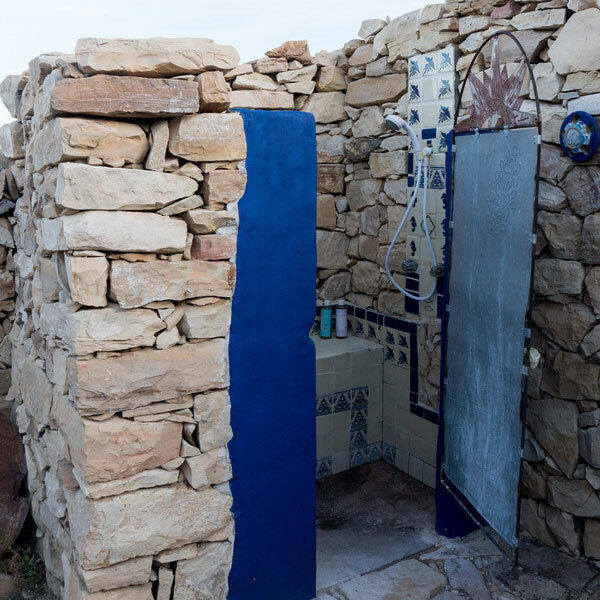 There’s a separate private bathroom in the flower garden with sink, flush toilet, and a bathtub. The Guest House is $175 a night plus tax, with a 2 night minimum stay (3 night minimum during the busy season). We like kids and dogs! There’s typically a 2 person maximum (call for special requests). Large bed with extra pillows, real cotton sheets and a quilt in-season with national park sunrise view from bed. There’s a simple indoor kitchen with sink, fridge, oven/stove and a small table. 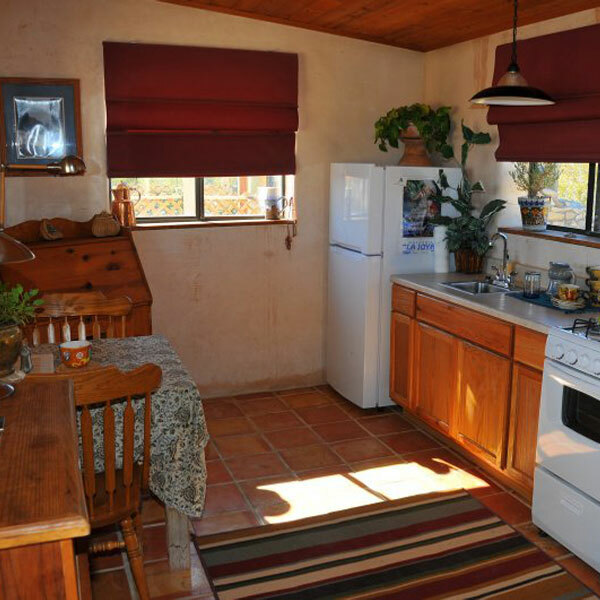 The patio features a full outdoor kitchen with sink, cooking, and dining area. 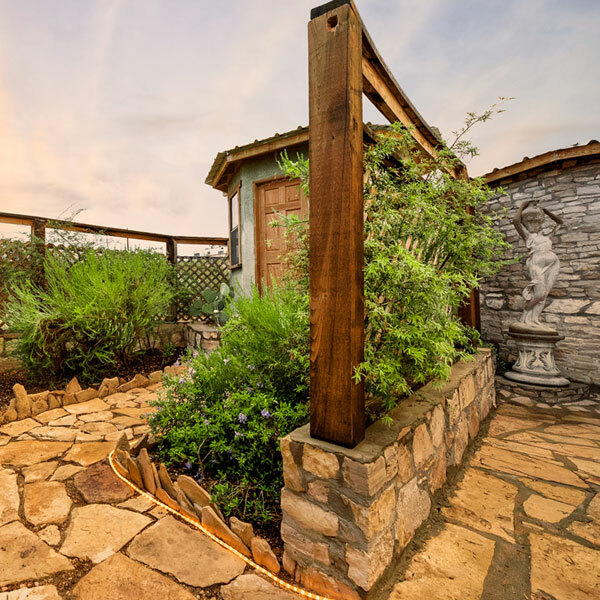 Enjoy a separate private bathroom in the flower garden with sink, flush toilet, and a bathtub. Decorated in Modern Moroccan style with exotic lanterns and a pillow ceiling. 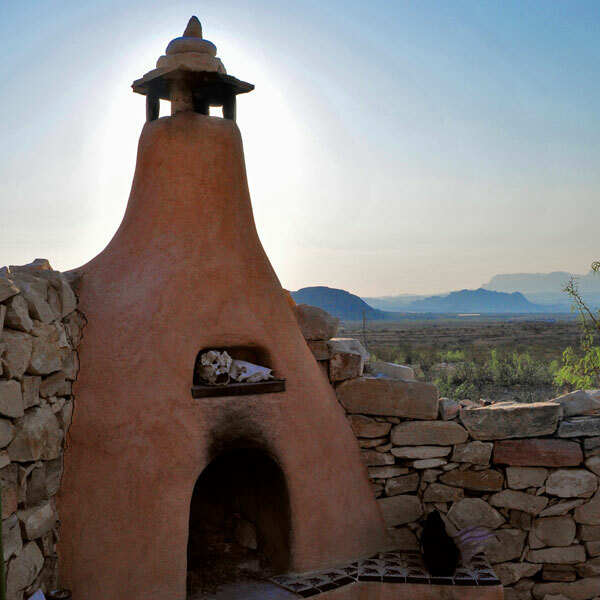 Cornered in the patio is an outdoor kiva fireplace for enjoying the night skies. Three beautiful courtyards separate this house from the others. 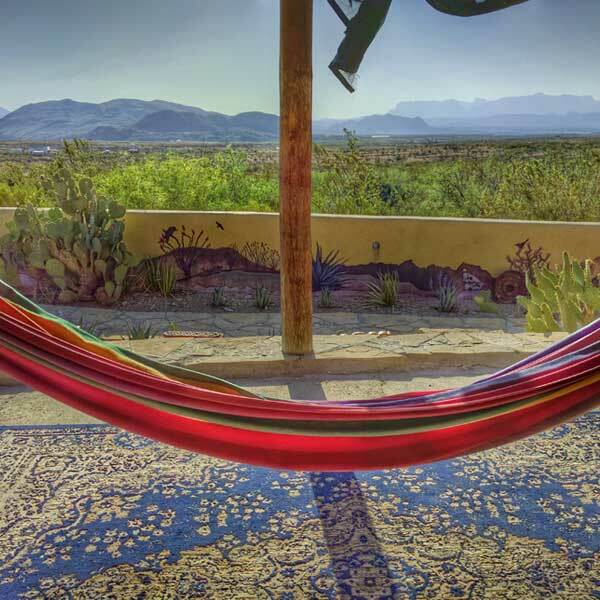 The first features a hammock, yoga rug, and stunning views. 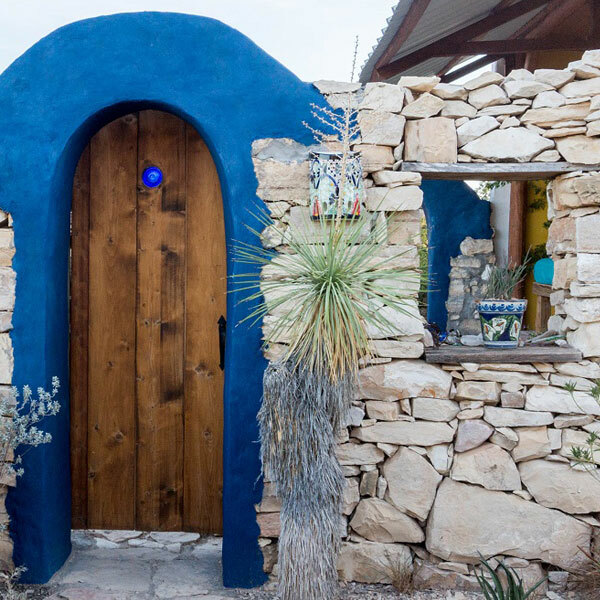 The second has an outdoor shower, a handsome outdoor fireplace, kitchen sink and counter, and the cabin, all enclosed by a 5 foot rock wall for privacy. 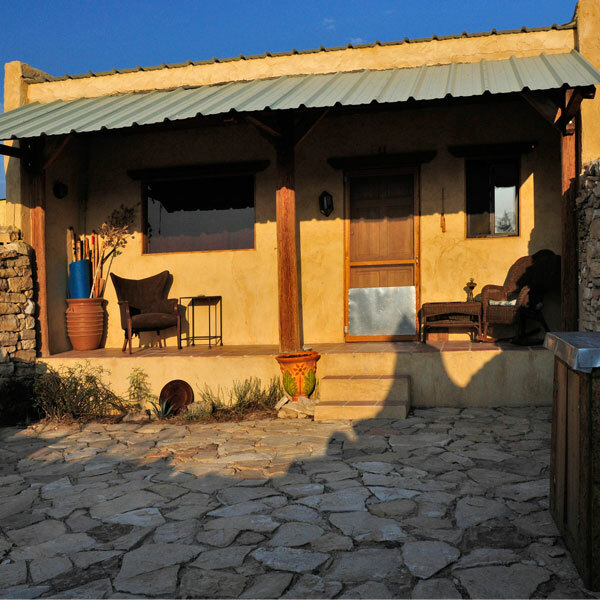 The third courtyard has an arbor surrounded by flowers, where one can relax on a full-size bed and enjoy the desert vistas. There’s a close parking spot just for you! Feel free to get up early, get back late, your private entrance ensures that you can come and go without disturbing anyone. I cannot wait to come back. There’s no other place I’ll even consider if I’m in the area. Thank you, Cynta! 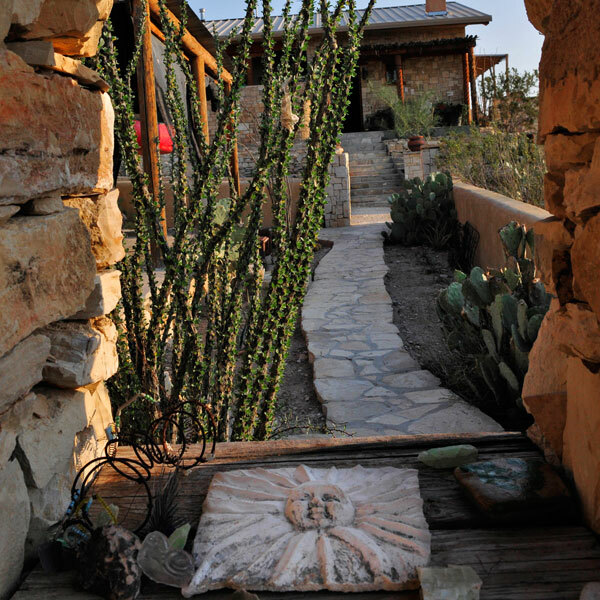 The place is lovely… it’s by far the nicest house in Terlingua. We had a wonderful time at the cottage and couldn’t have had a more gracious, welcoming and knowledgable host than Cynta!